Papua New Guinea went to the polls in June–July 2017 for its ninth general election since independence. Despite a record number of women standing — around five per cent of the total number of candidates — no women were elected in any of the 111 seats. 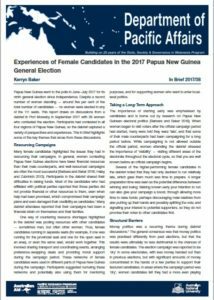 This report draws on discussions from a debrief in Port Moresby in September 2017 with 26 women who contested the election. Participants had contested in all four regions of Papua New Guinea, so the debrief captured a variety of perspectives and experiences. This In Brief highlights some of the key themes that arose from these discussions.